Our Youth Ambassador journalist Roxanna was at the FDM everywoman in tech Awards. 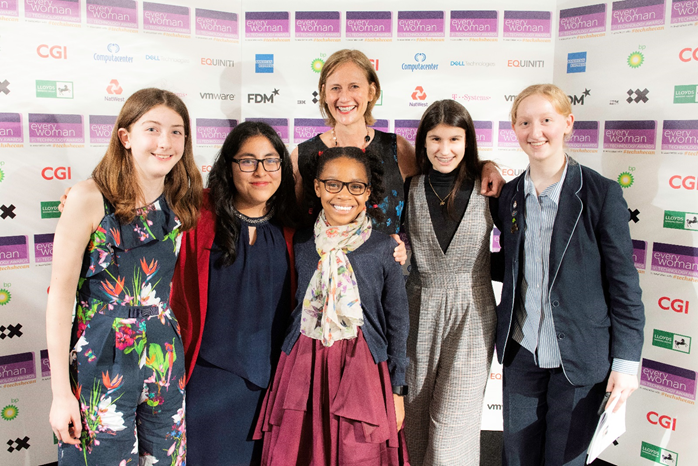 On Wednesday 6th March 2019, I was given the amazing opportunity to attend the FDM everywoman in Technology Awards, in association with #techshecan where women’s achievements in tech are recognised and celebrated. I was able to talk to many of the women in attendance who are all incredibly inspiring. As one of my first experiences as a journalist in this kind of environment, it was a wonderful opportunity that I will remember for the rest of my life. In addition to networking at the event I helped to collect money for the raffle held in aid of Modern Muse, a charity with a cause I feel very passionate about. Here I am on stage drawing the raffle with, Lily Marston who’s on the Modern Muse team at Microsoft and Karen Gill MBE co-founder of everywoman and Modern Muse. Firstly, I spoke to the girls nominated for the One to Watch Award. The group of nominees are girls aged eleven to eighteen who have actively encouraged girls to study STEM subjects in school stemming from their passion and interest in STEM based subjects and careers. Speaking to Laurelin Chase in Year Eleven, who has been working on a group project and competition to design a prototype wave machine for a zoo’s sea lion enclosure, she told me that “her journey to do what she strived to in tech involved a lot of stigma around her gender and what she had always wanted to do”. However, she powered through and became a finalist for this award. Another finalist who was up for the same award was Avye Couloute. Avye runs coding and computing workshops for girls like her and talks to them about STEM and encourages them to study in those areas. As well as this, she has a passion for building robots, and has won two competitions with them. Avye is in Year Seven and only eleven years old. Leslie Sarango Romero won the One to Watch Award for making an app called Eduscape, which makes learning maths fun for girls her age. Leslie with Clare Parry-Jones from Computacenter and Maxine Benson MBE co-founder of everywoman and Modern Muse. I was also able to talk to many of the other finalists including Tiffany Cooksley, who won the Apprentice Award and Pae Natwilai who won the Software Engineer Award. Both women mentioned about how the awards “pulled a variety of characters from all kinds of work in tech” to create a “brilliant forum” of like-minded women. I found talking to these women very inspiring and empowering. However, for me, the most inspiring moment of the evening was watching my mum, Amy Chalfen, win the Leader’s Award. Amy Chalfan, winner of the Leader award. I also had the immense pleasure of meeting the first female fighter pilot: Jo Salter. Jo has completed twelve years of reserve service and twelve years of full-time service. She became a fighter pilot by going through with a cadetship, and subsequently was sponsored by the Royal Air Force to do her degree, graduating in 1989. She was the first female fighter pilot to fly the Panavia Tornado ground attack aircraft with the 617 Squadron. She retired from the Air Force in 2000 and joined PwC (PricewaterhouseCoopers) in 2016. PwC is an international services network based in London, UK and is the second largest professional services firm in the world. At the awards, Jo was there not only to support the finalists, but also to assist PwC in promoting their Tech She Can Charter. The Tech She Can Charter is a commitment that PwC are pushing organisations nationwide to make; to increase the number of women working in tech across the UK. They are doing so by educating and inspiring young women to go into tech careers and share the best practice within the network of organisations involved. Jo is passionate about this charter and hopes to encourage many young women across the UK. These awards are a brilliant platform! They promote inspirational women to look up to as role models as well as encouraging these inspirational women to see just how incredible they are. After they met the other nominees, it was clear to see that these women are now all caught in an inspirational cycle as a result of meeting one another. There was such a wonderful atmosphere, which I think everyone should strive to emulate. Everyone I met proved to me that no matter who you are, you can do anything if you put your mind to it. If you work for a company, find out how you can support our Youth Ambassador Network to grow info@modernmuse.org.